Cider has been the hot! new! thing! for a minute now. Thanks to our bumper crop (yay, Nature!) of Michigan apples this year, cider seems to be sprouting up all over. I’ve certainly had some good ciders but after awhile it all just becomes, well, cider. I mean sure you can add some raspberry or some blueberry and it’s very good but it’s still cider with raspberry or cider with blueberry. So I am tickled to tell you about one of the best ciders–one of the best drinks–I have had in a long while. 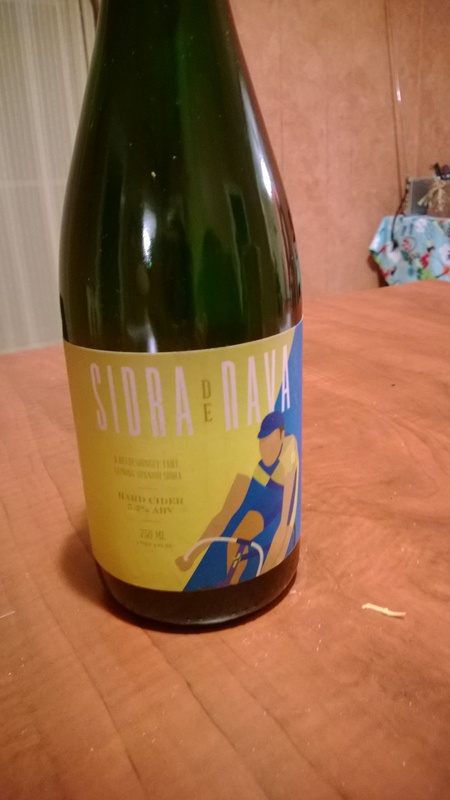 Virtue Cider‘s Sidra De Nava is a magnificently tart cider with the tang of lemons. Lemons! It is a beautiful sparkling drink that is light on the palate. The tart apples and lemony zest mix together perfectly. It is truly unlike any other cider I have ever have. Since actual lemons weren’t used in the making of it, it isn’t overwhelmed by the citrus (like some cider-berry blends can be). The cidery sounds lovely! The founder was the brewmaster of Goose Island for Christ’s sake…you know this stuff’s gotta be good! And it is.The sample that I got at the Produce Station convinced me to buy a bottle (as you can tell from the picture above) and I am looking forward to cracking it open on a special occasion…like maybe a Thursday? Hmm… sounds interesting. I may have a new cider to try!